USS GRIDLEY was the sixth ship in the LEAHY-class of guided missile cruisers and the third ship in the Navy named after Capt. Gridley. 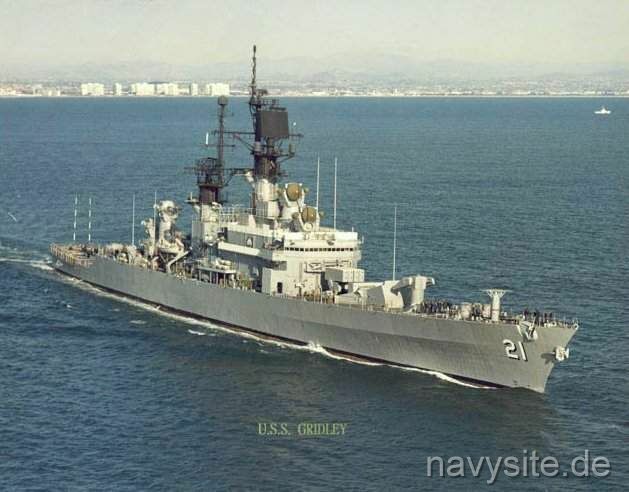 Commissioned as a guided missile frigate and later reclassified as a guided missile cruiser on June 30, 1975, GRIDLEY was decommissioned, stricken from the Navy Register on January 21, 1994 and transferred to the Maritime Administration for lay-up at the Suisun Bay, California. GRIDLEY was sold to International Shipbreaking Corp., Brownsville, Tx., for scrapping. Builder: Puget Sound Bridge & Drydock Company, Seattle, Wash. This section contains the names of sailors who served aboard USS GRIDLEY. It is no official listing but contains the names of sailors who submitted their information. 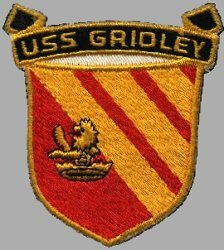 Click here to see which USS GRIDLEY memorabilia are currently for sale on ebay. Charles Vernon Gridley was born 24 November 1844 in Logansport, Ind., and was appointed to the Naval Academy in 1860. Reporting for duty with his class in September 1863, Gridley joind the sloop-of-war ONEIDA with the West Gulf Blockading Squadron and distinguished himself with Farragut at the Battle of Mobile Bay 5 August 1864. Promoted to Lieutenant in 1867 and Commander in 1882, he spent the next 30 years at various stations around the world, including a tour as instructor at the Naval Academy. Captain Gridley took command of OLYMPIA, Admiral Dewey's famous flagship, 27 April 1898, a post which he held despite failing health during the Battle of Manila Bay 1 May 1898. It was that morning that Dewey gave his famous command: "You may fire when you are ready, Gridley," immortalizing the doughty captain. After the destruction of the Spanish squadron and the capture of Manila, Gridley was obliged to leave his command because of his health, and died en route to the United States at Kobe, Japan, 25 May 1898. USS GRIDLEY was launched by Puget Sound Bridge and Drydock Co., of Seattle, Wash., 31 July 1961; sponsored by Mrs. Stewart D. Rose, great-granddaughter of Captain Gridley; and commissioned 25 May 1963, Captain P. A. Lilly in command. After outfitting at Puget Sound Naval Shipyard, Bremerton, Wash., GRIDLEY made a goodwill visit to British Columbia and then conducted acceptance trials out of her homeport, Long Beach, Calif. 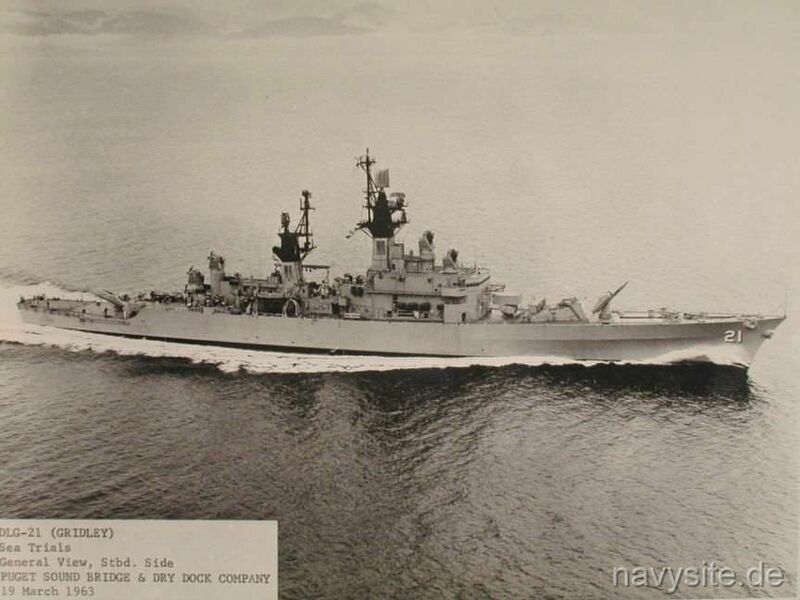 The powerful new frigate returned to Puget Sound Shipyard 8 November to 9 December 1963, after which she joined the Pacific Fleet as flagship of Destroyer Squadron 19. Following shakedown out of San Diego early in 1964, GRIDLEY departed Long Beach 8 April and steamed via Pearl Harbor to Australia for commemoration of the Battle of the Coral Sea, arriving Adelaide, South Australia, 5 May. 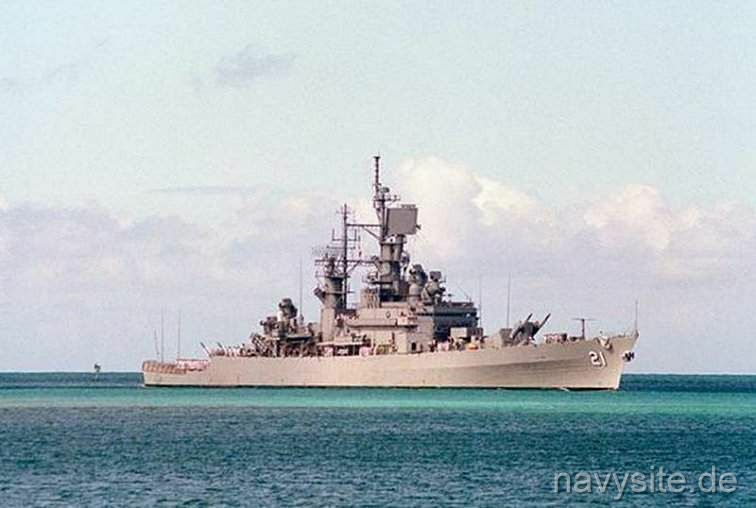 The guided missile frigate next headed for the Philippines, stopping at Subic Bay 29 through 31 May, before proceeding to Okinawa 2 June and Sasebo, Japan, on the 8th. Heading south once more, she returned to Subic Bay and visited Hong Kong. On 4 August, she got underway for the South China Sea escorting aircraft carrier CONSTELLATION (CVA 64) to strengthen American naval forces off Vietnam after Communist motor torpedo boats had attacked destroyers MADDOX (DD 731) and TURNER JOY (DD 951) in the Gulf of Tonkin. But for a brief visit to Subic Bay, she remained on station serving screening and picket duty, coordinating anti-aircraft warfare efforts, and relaying communications. Before she left the fighting zone 6 September, the ship's competent and dedicated service won her the Navy Unit commendation. She departed Subic Bay 7 November and reached Long Beach on the 21st. GRIDLEY operated along the West Coast until heading back to the Western Pacific 10 July 1965. Stopping at Pearl Harbor and Yokosuka en route, she steamed to the South China Sea to support aircraft carriers of the 7th Fleet as the flattops hammered Communist targets in Vietnam. On four different occasions in the next 4 months, she rescued pilots who ditched at sea. She returned to Yokosuka 7 December but resumed station in the South China Sea on the 22d to serve as "Tomcat," responsible for checking-in planes returning to their carriers. Early in 1966 she headed for home and reached Long Beach 1 February. GRIDLEY operated along the California coast until sailing for the Orient 18 November. She left Subic Bay 2 January 1967 for plane guard duty in the China Sea and the Gulf of Tonkin. After varied duties in the fighting zone, she sailed for Australia en route to the West Coast and arrived Long Beach 8 June to prepare for future action. In July 1968, the ship departed her homeport of Long Beach for an extensive overhaul and modernization at Bath Iron Works in Bath, Maine. Upon arrival in Maine, the ship was temporarily decommissioned in order to receive the Naval Tactical Data System (NTDS). 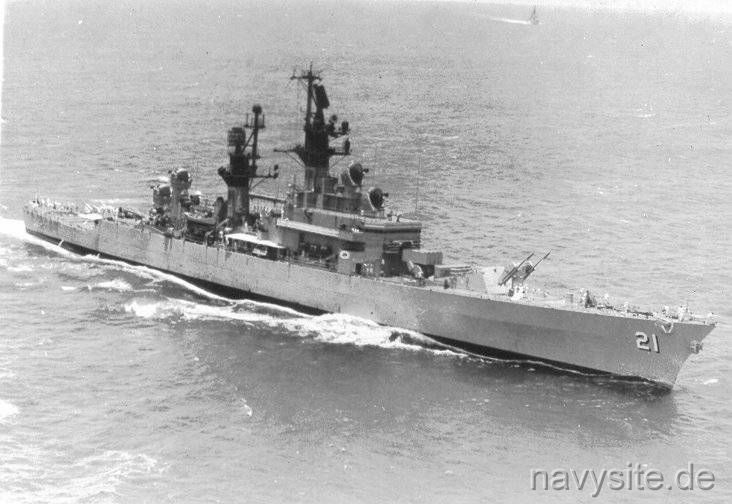 GRIDLEY returned to Long Beach in January 1970 and would make her 5th and 6th deployments to the South China Sea in 1971 and 1972. In February 1973, GRIDLEY underwent another modernization and overhaul, this time at Hunter's Point Naval Shipyard in San Francisco. During that time, she received an anti-missile defense system and electronic warfare equipment. 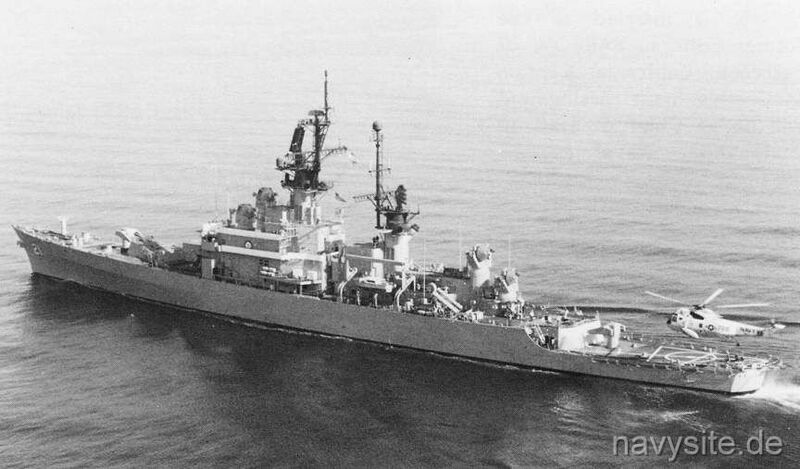 Upon completion of the overhaul, GRIDLEY arrived at her new homeport of San Diego in December 1973. GRIDLEY was officially redesignated as CG 21 in 1975, and made a 7th WESTPAC deployment. During the seven and one half month deployment, GRIDLEY provided air traffic control and on station support during "Operation Frequent Wind", the evacuation of persons from South Vietnam. GRIDLEY was also on station air traffic controller during the MAYAGUEZ incident off the coast of Cambodia. After a short 10 months back in her homeport, GRIDLEY returned to the Western Pacific in July of 1976. After another shipyard period in 1978, GRIDLEY deployed to the western Pacific in 1979. As a result of the Iranian hostage crisis, GRIDLEY remained on station in the Indian Ocean and North Arabian Sea through mid-1980. Before the year was over, GRIDLEY left again on a 7 month deployment, this time as Anti-Air Warfare (AAW) Commander for the CORAL SEA (CV 43) battle group. 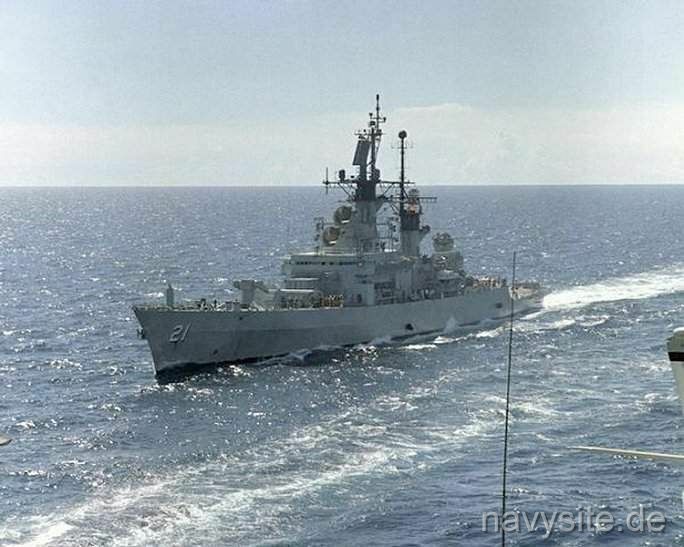 Upon returning to San Diego in March 1982, GRIDLEY was once again operating in Southern California waters until October when she returned to Long Beach Naval Shipyard for an extensive upgrade and an overhaul of all Engineering Machinery. More upgrades were made to the ship's fire control and air search radars and the Phalanx close-in weapon system was installed during 1982. GRIDLEY returned to the operational fleet in October 1983. GRIDLEY spent a year, October 1983 to October 1984, undergoing extensive training and workup for her next deployment. The ship deployed for the 10th time from October 1984 until May 1985. Following its return home, the ship immediately began a series of workups which culminated in a multinational exercise with several Pacific rim navies. July 1987 marked GRIDLEY's 12th deployment, this time as part of the RANGER (CV 61) battle group. The ship saw action in the Arabian Gulf during retaliatory strikes against Iranian oil platforms. 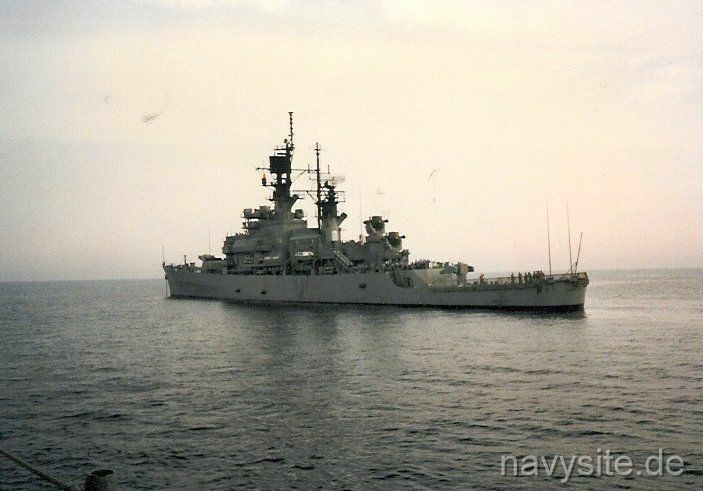 The ship began its 13th deployment in December 1988, once again returning to the Arabian Gulf. As an asset of Commander, Joint Task Force Middle East, GRIDLEY was responsible for escorting reflagged Kuwaiti oil tankers through the Straits of Hormuz. During a 3-month period, GRIDLEY safely escorted nearly 2.5 million tons of shipping in the Arabian Gulf region. The ship returned to San Diego in June 1989. 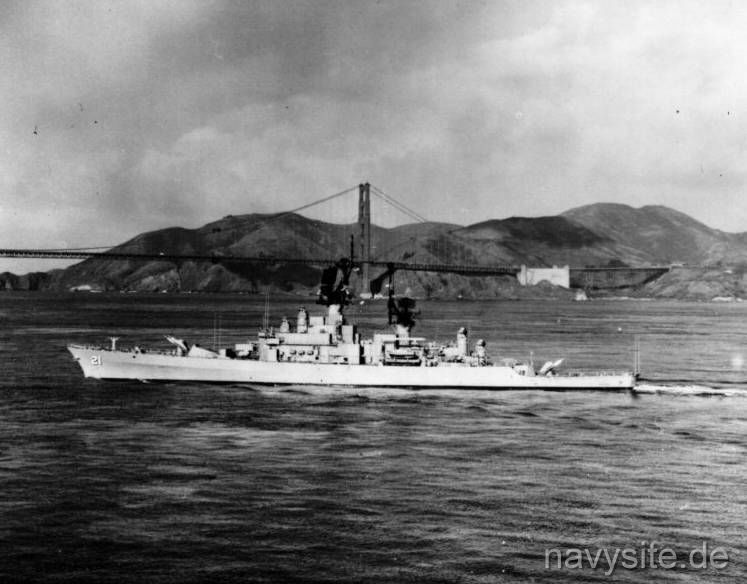 In October of that year, the ship's port visit to Naval Station, Treasure Island, CA, was interrupted by the 7.0 earthquake which struck the San Francisco Bay area. GRIDLEY personnel provided assistance to victims in San Francisco's severely damaged Marina district. The ship would later be awarded the Humanitarian Service Medal for its contributions to the relief effort. In November 1989, the ship participated in law enforcement operations in support of the U.S. Coast Guard. From February 1990 until March 1991, GRIDLEY received the New Threat upgrade at Southwest Marine Shipyard in San Diego. During the $55 million overhaul, all engineering, berthing and food service areas were upgraded, and the ship's combat systems were dramatically enhanced. Improvements to the air search radars and Combat Direction System improved the ship's ability to detect and engage multiple air threats with it's SM- I and SM-2 surface-to-air missiles. Following an extensive operational evaluation and qualification phase, GRIDLEY deployed for the 14th time in April 1992. Upon arrival in the Arabian Gulf, the ship operated in support of USS INDEPENDENCE (CV 62). The ship rescued the disabled merchant vessel ADEL 11 in the North Arabian Sea in June 1992. In August, GRIDLEY participated in a multinational exercise with regional navies. When operation SOUTHERN WATCH, the enforcement of a "no-fly" zone over southern Iraq, commenced later that same month, GRIDLEY was the first ship on station off the coast of Kuwait. GRIDLEY provided coastal radar coverage and AAW protection for ships in the northern Arabian Gulf. The ship returned to San Diego in October 1992. GRIDLEY was overhauled at the National Steel and Shipbuilding company from January through April 1993. During that time, the ship was back-fitted to accommodate the new SM-2 block III missile. The modification gave the ship the capability to defeat the sea skimming cruise missiles which have proliferated worldwide in the 1990's. In July 1993, GRIDLEY fired several of the new missiles on the Pacific Missile Test Center range, scoring 3 successful hits. That same month, the ship rendezvoused with USS CONSTELLATION (CV 64) in Acapulco, Mexico, escorting her back to San Diego after the carrier's 3 year Service Life Extension Program overhaul at the Philadelphia Naval Shipyard. After a final port visit to San Francisco in October 1993, GRIDLEY returned to San Diego in order to prepare for decommissioning after more than 30 years of service in the United States Navy. GRIDLEY was decommissioned, stricken from the Navy Register and transferred to the Maritime Administration for temporary lay-up on 21 January 1994. She was laid up at the Suisun Bay, California reserve to await disposal. The photo below was taken by Brad Manzenberger and shows the GRIDLEY at anchorage in the Indian Ocean in 1989. The photo was taken from the USS CROMMELIN (FFG 37).